A pair of overlooked solo acoustic guitarists reunites 50 years after appearing together on John Fahey’s legendary 1967 Takoma sampler LP for a fine, succinct program of that for which they are each best known. 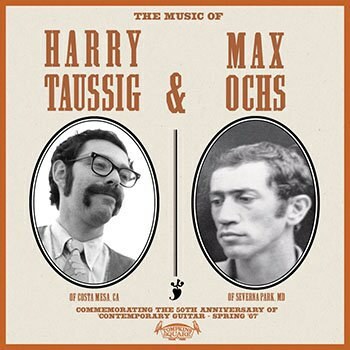 Fifty years ago, and alongside giants in the field like John Fahey and Robbie Basho, a pair of relatively obscure solo acoustic guitarists named Harry Taussig and Max Ochs appeared on a sampler LP from the Takoma label entitled Contemporary Guitar: Spring ‘67. The latter was a cousin of folk icon Phil Ochs and the former was a handlebar mustachioed guitarist operating within a similar stylistic framework as Fahey. Sadly, their names were largely lost to history, cropping up only amongst the most die-hard fans of the Takoma label and other equally esoteric instrumentalists. Given the overabundance of artists and music that have been recovered in the 21st century, it was only a matter of time before a couple of previously overlooked artists got their due, and that's precisely what happens on this collection. Tompkins Square has long set about championing the overlooked artists within the already largely overlooked genre of solo acoustic guitar records both past and present. For those unfamiliar, there is often little to differentiate one player from another, save for some close listening and time spent absorbing the idiosyncrasies of each. Of course, Leo Kottke and the late Fahey are two of the most well-known solo guitarists, and each has had their own distinct style captured across a number of albums over the years. Beyond that exists a hierarchy that only becomes that much more obscure the further down you go. Residing somewhere in the middle -- below the likes of Robbie Basho and Jack Rose but above many of the names found on the original Imagination Anthemseries -- one can find the works of Taussig and Ochs. Half a century later, the pair has once again joined forces for an album of contemplative, measured, and largely improvised instrumentals commemorating the original sampler LP. As is often the case with such sets, there is a relative uniformity to the music; it's often meditative and circular, exploring and following motifs to their logical conclusions while taking their time getting there. “When Yellow Leaves Do Hang” plays with a major/minor structure that toes the line of standard pop compositions in terms of verse/chorus/verse structure. At nearly five minutes, it offers an autumnal and wandering feel that at times seems to get lost within itself. Indeed, the majority of the collection revolves around a meditative approach. It’s easy to imagine either Taussig or Ochs lost within their own six-string wanderings. “Into the Veil of Years”, much like all that precedes it, slowly builds around a gently plucked multi-string melody that uses fairly rudimentary harmony and complementary bass notes lurking below. Breaking up the somnambulant solo guitar tracks, “Remembrance of Things Future” features Taussig on a closely-mic’d banjo. With fingers stumbling across the strings, it alternates between hints of notes and percussive twangs reverberating against the banjo’s drum head-like resonator. Following little in the way of discernable melodic structure, it plays more like the avant-garde noodling of Henry Flynt or, to a lesser extent, Derek Bailey. It’s a rather incongruous entry that temporarily disrupts the otherwise soothing flow of the album. Featuring a gorgeously warm and bassy performance, “Boogie for Barry Master” is a clear highlight, one owing a debt of gratitude to Fahey’s mining and reimagining of early American song forms. With deeply resonant bass notes, it shows off Ochs more full-bodied, utilitarian approach that stands in sharp contrast to Taussig’s more skeletal, trebly approach. Likewise, the nearly 11-minute “See What Tomorrow Brings” finds Ochs showing off a few of the tricks he picked up under the tutelage of Mississippi John Hurt, his primitive slide slithering up and down the fretboard. With each artist operating in their own distinct stylistic framework, the two sides nicely showcase the traits of each. Taken together, it’s a fine collection of new recordings by two great overlooked artists who’ve come into their own more than a half century after they laid down their first recordings.